New Koden KGC-300 IMO Certified GPS Compass supplied with 4.3" colour GPS display. Features 3 x Heading Data output ports which is expandable to 5 x ports. The KGC-300 consists of a colour 4.3" display unit where heading, position, speed and course data can be shown in large easily legible characters, an external antenna with 15 metre cable and a processor unit. 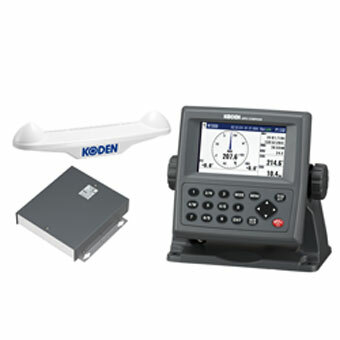 The KGC-300 features a 16 channel parallel GPS engine providing heading accuracy to 1° with a heading resolution of 0.1° An important feature is the KGC-300's internal electronic compass and rate sensors which seamlessly act as a backup heading output should GPS reception be interrupted, for example when sailing under a bridge.